The scenes of destruction are still fresh on everyone’s mind. In fact, you can easily find plenty of neighborhoods that are still ravaged due to Hurricane Harvey. The Gulf Coast hasn’t recovered from last year’s hurricane season, but it’s time to get ready for the next round! Fortunately, there are things that you can do to help get you and your family prepared for hurricane season. The key is to start preparing now. And as an added bonus, it is good to know that many of these tips are just smart to know for any emergency you might face. Hurricane Preparedness Tip #1 – Decide If You’re Staying or Leaving! Indecision isn’t good when you’re talking about emergency preparedness. Many people have different opinions when it comes to evacuating or riding out a storm. You need to take into account your family situation and your level of acceptable risk. For example, if you have elderly parents or grandparents living with you, you might not want to risk losing power for days and seeing them overheat. At the same time, you don’t want to be on the road and get stuck in traffic with everyone else trying to evacuate either. Older people and extremely frail individuals died on the side of the freeway during Hurricane Ike because their vehicles ran out of gas and they became overheated! You need to decide early on if you are going to evacuate. It is always better to make plans when you are not in the middle of a crisis situation and then activate those plans when the time comes. You can visit family in another state, get a cheap hotel or motel room, travel far enough inland and go camping or whatever else you would like to do if you want to evacuate. But don’t delay in making that decision! Many people know that they should get basic supplies. Food, water, and batteries usually fly off the shelves when a Hurricane’s path is published where it will land. However, there are somethings that people don’t think about that should be considered. You have food, but do you have a way to cook it? If your power goes out, you don’t want to cook inside on your stove. Even if you have a gas stovetop, using it will heat up your kitchen and by default your home more than it needs to be. Instead, you will want to cook outside, like on a burner of a gas grill. Or, you could purchase a propane stove and some small canisters. This will allow you to cook and warm-up food without adding heat to your home. Are you a coffee drinker? If you are a coffee drinker, you don’t want to be dealing with the lack of caffeine after a big storm. You should either get some coffee singles that you can drop in some hot water or get an old-fashioned percolator coffee maker that you can use on your propane stove. Do you have all the medication you need if the power was out for a week and you the pharmacy didn’t have the power to open? Make sure that you don’t have any important medication prescriptions ready to be filled. Do you have laundry and dishes to be washed? Wash all your dirty clothes and all your dishes just in case you don’t have the power to start your washer machine. You don’t want to run out of clean underwear! Hurricane Preparedness Tip #3 – Get an Inverter! An inverter is priceless when you lose power in a hurricane or storm. It can save you from losing all of your food in your refrigerator or freezer. You will have access to power to charge your smartphones, tablets, and laptops. And it provides power to run a fan to cool down the elderly. They cost a fraction of what a generator costs, so every family can afford one. Inverters connect to your car battery, either through alligator clips that connect straight to the battery or through the cigarette lighter. They convert alternative power (12 volt AC) to direct power (110 volt DC). You then run an extension cord into your house, connect an electrical strip and power your electrical devices. You should keep your vehicle on when you are powering electrical devices. Your vehicle has a huge gas tank. This will ensure that you can power your electrical devices for a long time if you fill up your gas tank before the hurricane hits! You don’t have to run your refrigerator or freezer non-stop. You really only need to run it for 1-2 hours to keep the inside cold or frozen until power is restored to your neighborhood. The inverter needs to be big enough to handle the surge that your refrigerator/freezer will require to start the compressor. An inverter of 1500-2000 watts should handle this for you. Remember, the purpose of having an inverter for your refrigerator and freezer is to save the food you have inside. The power that the inverter offers shouldn’t be used to replace your normal electrical power. You want to keep getting into your refrigerator to a minimum. You don’t want to spend a ton of money replacing everything inside your fridge! Hurricane Preparedness Tip #4 – Have a Good Ice Chest Ready! When your power goes out during a hurricane, and it’s hot, you will want something cold to drink as well as have a place for cold items you will want to use while the power is out. Remember, you don’t want to be opening and closing your refrigerator doors when the power is out! Newer ice chests do a good job of keeping ice for days! For example, the 120 quart Coleman Coastal Xtreme Cooler boasts that it will retain ice for up to 6 days, even in 90 degrees heat. One way to ensure your cooler stays cool is to put plastic rectangular juice containers filled with water and frozen on the bottom of the cooler. Then, pour in about an inch of water, and fill with ice, leaving room for your drinks, water bottles, and other items to keep cool. Make sure you place your cooler in a shaded area. When the hurricane hits, you will want to stay aware of what is going on around your area. During Hurricane Harvey, many people communicated and rallied to help because of social media. As a result, battery chargers and solar battery chargers proved invaluable to charge phones to stay connected. I recommend that everyone have a battery charge for everyday use as well as during crisis. One that is affordable and about the size of a normal cell phone is the Ayyie Solar Charger. It has a small solar panel on it, but don’t count on it. It really should be charged from your computer or the wall. But due to its 10,000 mAh size, it can charge your phone 2-3 times. And like I mentioned, it is about the size of a regular cell phone, so it can fit in your back pocket or your purse. If the power goes out for multiple days, you will want a true solar charger/battery bank combination. One of the best ones on the market is the Kogalla solar storage bank. The solar panels will fully charge the 10,000 battery in 3-5 hours. I used this charger during Hurricane Harvey and it worked like a champ! Many people inland don’t usually evacuate due to a hurricane. However, the havoc of Hurricane Harvey sure is a good example of why you should have a Plan B! The people on the Gulf Coast didn’t receive much damage due to Hurricane Harvey, but the hurricane dropped so much rain that flooding was very widespread up and down the Gulf Coast. Your Plan B can be to evacuate to the home of a relative or even go far enough inland that you can get a motel. Don’t wait too long to pull the trigger to evacuate. And when do, make sure you have everything ready to go, like your bug out bag (go bag) and your emergency binder with all your important documents. People who flooded during Harvey lost everything, including important documents that are hard to track down and some that might not even be able to be replaced like high school diplomas. Having an emergency binder will ensure that you are not spending countless hours on the phone with various agencies and businesses trying to get copies of your important documents. In fact, if you are making one emergency binder, it’s just as easy to make two or three. Keep one sealed up with a family member and you might even want to put one in a safety deposit box. For more information on emergency binders, click here. A generator is a great tool to have when the power is out. During Hurricane Ike, my in-laws were without power for a week. My father-in-law connected his generator to his circuit breaker panel and powered his whole house. They were able to stay cool by running a window unit instead of their AC. Running a generator for an extended time can be costly when you consider fuel. If your generator is big enough to share some of the load (power), you might consider asking your neighbor if they would like to have access to your generator if they contributed to the fuel costs. Of course, you would have to have some guidelines like how long you will run the generator if you are not going to run it all day. And someone would need a long extension cord. But by offering your neighbor access to your generator, you might save him a lot of money by keeping his refrigerator and freezer cool. You will also allow him to charge his phones, laptops, and batteries. He would truly be appreciative. Many hurricane supplies are common sense items that you should have already in case of an emergency. So you shouldn’t need to go buy batteries, flashlights, candles, and water. However, there are food items that you will want to be stocked up on and you will want some comfort food. But don’t wait to get those items! Hurricane trackers are pretty accurate nowadays. When you see that a hurricane is headed for you, go to the store and pick up your items! Many people are stocking up a lot sooner due to the big high profile storms that we have had. And, if you are buying items that you will eat or need anyway, then it’s not like you are wasting any money. Recent hurricanes have proven to us that we should prepare accordingly. 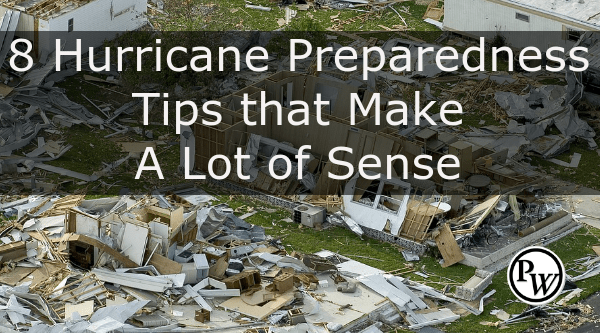 If you take reasonable steps to prepare, you can help to mitigate some of the potential discomforts that a hurricane can cause. 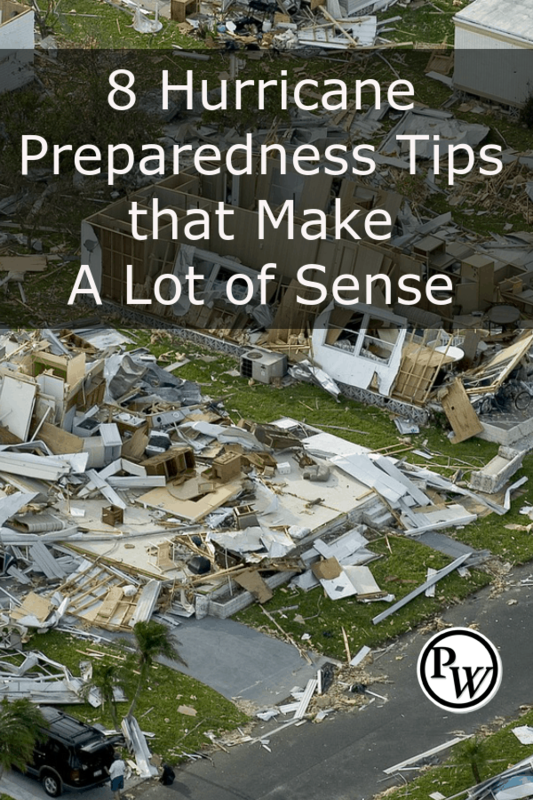 Hurricane preparedness doesn’t have to cost a lot of money. You just need to do it! And do it before a hurricane is coming straight for you! For more articles on Hurricane Preparedness – CLICK HERE and HERE.